Reduced flicker and blue light make viewing the GW2870H 28" Widescreen LED Backlit LCD Monitor from BenQ easy on the eyes. BenQ has integrated Flicker-Free Technology into this display which virtually eliminates all flicker within the screen to reduce eye fatigue. 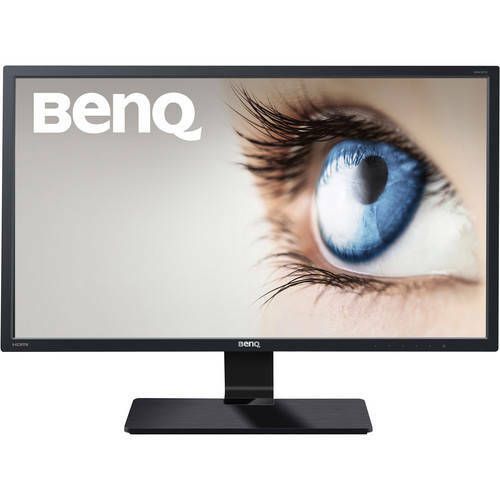 Additionally, you also benefit from BenQ's own Low Blue Light mode complete with specific settings for multimedia, web browsing, office use, and reading. By adjusting the blue light for specific activities you can reduce the possibility of eye strain and damage during extended periods of viewing. Enhanced Contrast Ratio - An ultra-high native contrast of 3,000:1 adds enhanced color depth and definition to darkened, complex images with the improved subtlety and clarity. 8-bit Color Table - An 8-bit VA panel delivers smooth and stable color transitions by rendering a total of 16.7 million color shades simultaneously. A 6-bit panel with Advanced Frame Rate Control (AFRC) requires interpolation to display the same number of colors as a true 8-bit panel does. 178° Horizontal and Vertical Viewing Angles - VA panels bring truly authentic colors and ultra sharp details from left, right, above, and below to your eyes with a wide-viewing angle of 178°/178°. HDMI Multimedia Interface - The integrated HDMI high-speed multimedia interface makes this monitor convenient to use - now you can enjoy digital entertainment effortlessly even with additional multimedia equipment in the future.